Cogzidel Technologies Pvt Ltd is a young and vibrant company located in Madurai and specializing in Web development and Mobile app development. 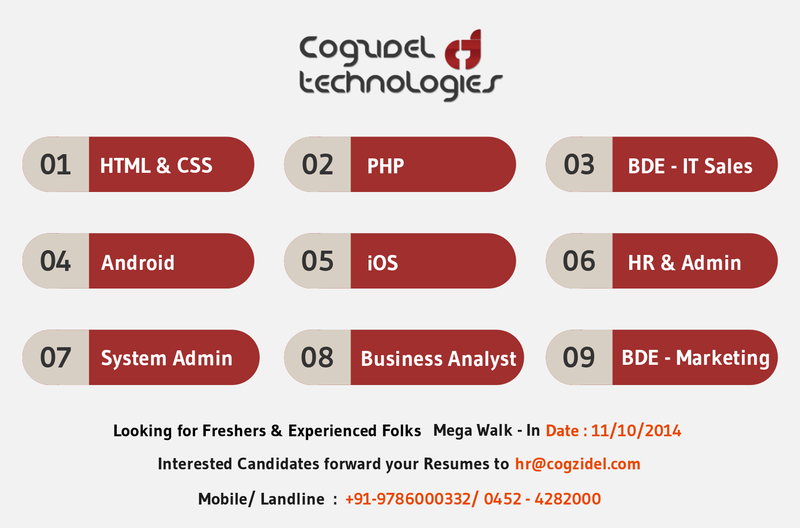 Cogzidel Technologies have been in existence since 2008 & has built careers for 5600+ young professionals belonging to the rural part of India. Now we are waiting for the brightest minds around Madurai to be a part of Cogzidel family. Taking overall responsibility for recruitment activity and campaigns. Manage LAN, WAN, network segments, Internet, and intranet systems. Qualification: We don’t feel Qualification to be a deciding factor for judging one’s talent. If you feel fit into our requirement, please walk-in with your resume. Landmark: Opposite to Hotel Duke. Previous Entry Platform to unleash your potential..
Next Entry On this festival of lights, Cogzidel wishes you all a very Happy Diwali!! Will you accept candidates from virtual locations? like I am from Pakistan and want to join your organization. We are immensely pleasured with your response. Currently we don’t have such options in our organization. We will give further clarification on your queries personally through the mail. Hi Freshers its a great opportunity , Bag it up !! I m ready to work in u r organisation, bit I m a B.com graduate and MA in sociology, with computer background knowledge. I m waiting for a chance.